What true prosperity is, and how it can be realised, are fundamental questions that must be answered by every country. Over 11 years, the Legatum Prosperity Index has evaluated long-term changes in global prosperity, pinpointing some of the drivers of progress and highlighting those nations that have made the greatest strides forward. As our Index shows, prosperity has been growing around the world. This seems remarkable, given our present turbulent times. We have seen the rise of terrorism, through groups such as Islamic State and Boko Haram. A vast number of people have left their homes in the Middle East and Northern Africa, risking their lives to travel through war zones and across oceans for a highly uncertain future in Europe – in effect, seeking their own personal pathway from poverty to prosperity. We have also seen populist movements gain strength, leading to the election of Donald Trump, and the success of populist parties in Germany, the Netherlands and Hungary. Despite these developments, global prosperity now sits at its highest level since the Index was first published in 2007. More countries experienced growing prosperity (88) than falling (61) in the last year, with the greatest increases coming in the Asia-Pacific region. The most important driver of this improved prosperity over the last 11 years is the significant strengthening of the world’s Business Environment, one of the nine pillars of the Index . Growth in prosperity has been unequal, however. The gap between the top and bottom scorers in the Index has been growing for five straight years; and the lowest score in the Index (held by Yemen this year) has not been so low for eight years. Some declines in prosperity are very concentrated, such as those being seen in Latin America – most notably in Venezuela, but also in Nicaragua, Ecuador and El Salvador. Furthermore, countries such as Syria are devastated by conflict, and their declining prosperity significantly affects their neighbours. Syria is among a group of nations where accurate data collection is not possible, due to either conflict or governmental restrictions. This resulting imbalance in prosperity threatens wellbeing as well as wealth, most notably in Safety and Security. In this pillar, the least prosperous 30 countries have now witnessed a near-continuous 10-year decline, even while the top 30 countries have seen a modest improvement. The world may find it can increase prosperity, but growth will always be muted when it cannot be shared by all. At first glance it may appear that the rankings this year broadly reflect traditional measures of wealth, with the bottom of the prosperity table populated by poorer nations which have not seen an increase in their GDP, and the top dominated by those which have been more successful. On closer inspection, however, it becomes clear that a nation’s prosperity ranking is not determined by wealth alone; it also depends significantly on wellbeing. In fact, there are many diverse elements, with relative importance depending on culture and place, which determine the life chances and opportunities available to a nation’s citizens. In bringing together such a broad range of indicators, our aim is to characterise the many different routes to prosperity. This is essential if we are to make meaningful comparisons in a world with distinct and equally valuable pathways to a fulfilling life. Two groups that demonstrate this truth are the Nordics and the Anglosphere. Their nations enjoy the highest overall prosperity in the world, with a representative from each at the number one spot for each of the last eleven years, held this year by Norway. Yet the Anglosphere and Nordics are successful for different reasons. The breadth of the Prosperity Index allows it to pinpoint not only the drivers of, but also the obstacles to, a nation’s prosperity. It allows a unique look at the specific constraints to progress, highlighting where research and policy work should be most readily focused. With this deeper perspective it becomes possible to look at nations, not just in terms of where they are now, but where they could be in the future. All people should have the opportunity to live in a country in which their wellbeing is promoted; and searching out the areas in which nations have potential to grow is a crucial part of realising this goal. The Index provides a powerful tool for identifying where the progress of countries is held back, due to a deficit in key areas of prosperity. For example, countries in the fourth quintile (ranked 91-120) generally underperform in Personal Freedom and Governance; they have much worse basic legal rights than those at the top of the rankings; they typically have weak rule of law and their citizens do not (or indeed, cannot) participate politically. They also see a notable deficit in the strength of the Education pillar compared to top-ranking countries. It is this standout deficit in Governance and Personal Freedom among less prosperous countries, together with the long-term divergence in Safety and Security, which has triggered our focus in this year’s report on institutions. Institutions, both formal and informal, provide the civic framework within which wealth and wellbeing become sustainable. Four pillars of the Index measure the strength of institutions: Governance, Personal Freedom, Social Capital and Safety and Security. We have chosen to focus on them in this year’s report in order to explore the institutional foundations of prosperity. 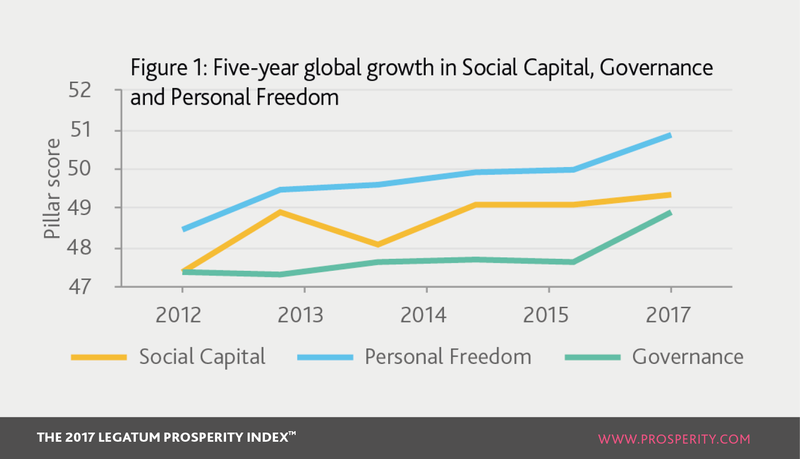 In global terms, Governance, Personal Freedom and Social Capital have all risen since 2007 (Figure 1). The quality of Governance around the world, which had fallen sharply after a high in 2009, has now rebounded and sits at its highest level in the history of the Index. All geographic regions of the world saw Governance improve over the last year, with Asia rising fastest. On average, people perceive judiciaries to be more independent of government than last year and believe that regulations can be more easily challenged in the legal system. For example, Ethiopia saw improvements in judicial independence, while in Belarus, there was a lower reported perception of corruption. Not only do the rule of law, strong institutions, and high regulatory quality contribute to economic growth; effective and accountable government also increases public trust and, ultimately, results in higher levels of life satisfaction among citizens. Personal Freedom has recovered from a low in 2012, bettering its 2007 level for the first time. Asia and Sub-Saharan Africa registered the strongest growth this year and countries throughout other regions have seen significant improvements. Cyprus has improved through a reduction in compulsory military service, while over the last five years Iraq has seen the greatest increase in citizens’ satisfaction with freedom. In North America, however, Personal Freedom has significantly weakened, and so too in parts of Europe, where the strain of the migration crisis now appears to be having a negative effect on tolerance levels in receiving nations. Societies that foster strong civil rights and freedoms have been shown to enjoy increased levels of satisfaction among their citizens. But so too does the economy benefit when personal liberties are protected and a nation is welcoming of the social diversity that stimulates innovation. The world’s Social Capital – the extent to which people trust and support each other – has improved more in the last decade than any other of the four Institutional pillars. A person’s social and economic wellbeing is best provided for in a society where people trust one another and have the support of their friends and family. This pillar highlights the contribution of social networks as an asset that produces economic returns and improves wellbeing. Asia has been the long-term improver, although this year the greatest gains were in MENA and Sub-Saharan Africa. It is also troubling to see a decline in some developed nations such as the UK and the US. While the pillars of Governance, Personal Freedom and Social Capital have all made improvements in the last decade, the strengthening of institutional foundations worldwide has come under threat from falling Safety and Security, which continued its decade-long decline in 2017 (Figure 2). This is alarming: wellbeing and economic growth are strongly dependent on citizens being kept safe from conflict and crime, and being housed and fed. Nearly two-thirds of the 149 nations in the Index saw their scores fall this year, in what was the largest single-year fall in its eleven-year history. 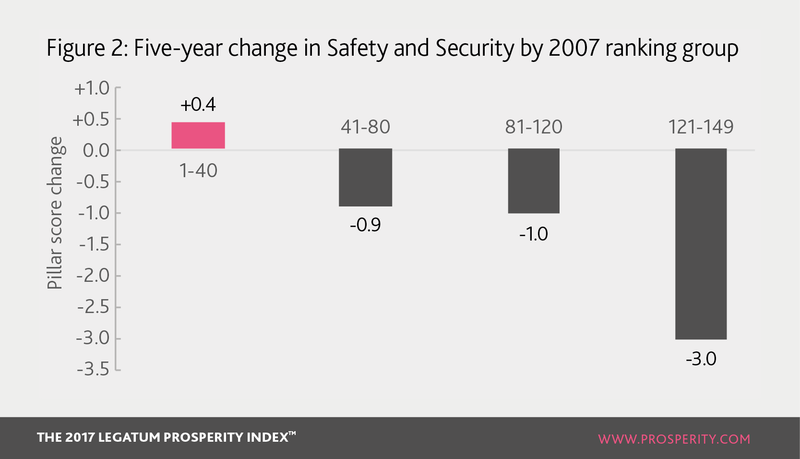 Eastern Europe was the only region where Safety and Security improved, while all the others, led by the Middle East and North Africa (MENA), saw worse scores than in earlier years. In nations such as the US, falling Safety and Security has been buffered by otherwise strong institutions of government, but in regions where institutions are more fragile, such as Latin America and the Caribbean, the stress can no longer be withstood. Prosperity is at its highest point for ten years, and yet too few of the world’s inhabitants are enjoying its fruits. Much needs to change to enable all nations to fulfil their potential in the nine pillars of prosperity. Given the different political, cultural and geographic contexts in which nations find themselves, the solutions to realising such potential could scarcely be more wide-ranging. This year’s Prosperity Index has sought to offer a window into the many routes to progress that nations have taken, or in some cases have been forced to take. Our hope is that our Index can help all governments and policy-makers to identify the pathways to a fulfilling life for all.